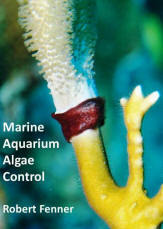 Coralline Algae Control Bob, Do you know of any secret ways to remove thick coralline algae from acrylic? Picked up a 180 for my personal display but it has dried thick coralline, thought I'd ask an expert to see if there is an easier way besides elbow grease. Thanks Vince >> , The real thick stuff? Other than a veritable army of Hermit Crabs, the only super safe way I know is to have the tank empty, and slowly, but surely pour dilute solutions of a weak acid (my fave is white vinegar, i.e. acetic) over the areas, slowly dissolving the carbonate away... all else really scratches the panels... Best to not allow it to accumulate way too much, eh? Bob Fenner.